It has been a while since I last posted. For good reason, I assure you. I’ve been working on some great things for the future. But first, I have to get some unhappiness out of the way. I’m closing down AfterPad. For greener pastures, I hope. But still, saying goodbye is never easy. I started AfterPad with one main goal in mind: create the website I wanted to have, as a MFi controller owner. I wanted a place where every MFi controller compatible game was laid out cleanly, clearly, and completely. I figured others might want the same thing, so I built it. I also wanted a place for news, reviews, and discussion of MFi controller content. There isn’t much out there in the way of editorial content for MFi controller fans. The big sites would mention controller support in passing, but they were focused on the mobile gaming audience at large. Again, I saw a place for myself – as niche writer, but an authority in my field. And MFi controllers were, and are, a niche that deserves writing about. I figured that if I could generate enough revenue to pay for my MFi controllers and fund my game downloads, the site would be a success. My MFi controller hobby would be fully paid for, and the community would have a great resource. If my writing was good, I might even be able to carve out a small name for myself in the Apple / gaming / iOS writing ecosystem I love so much. AfterPad succeeded at these goals, far beyond my expectations. It has been a pleasure to be a part of it for these past years. AfterPad was built entirely by me. It was hand-coded, personally designed, and meticulously crafted to be the very best website I know how to make. Many sleepless nights were spent adjusting the smallest details of font spacing, optimizing the last few kilobytes of load time, creating the perfect experience for every iPhone and iPad. I’m immensely proud of the work I’ve done. There was, however, one big problem: where do I go from here? All the low-hanging fruit was picked. AfterPad was generating steady income as a one-man blog, but I have ambitious ideas about the type of place MFi gaming deserves, and I’ve reached the point where these ideas outstrip what I can build as a one-man spare-time project. I considered many ideas for how to solve this problem. One idea kept sticking out: join a major company who shares many of my goals and desires. So that’s what I’ve done: as of this week, I’m officially a member of Gamevice! I’ve worked with many different companies over the years I’ve ran AfterPad, but Gamevice has always stood out as something special. From the very first version, the Gamevice has been far-and-away the best MFi controller. It’s creators have been incredibly receptive to my feedback, and have been incorporating my suggestions into their product for years. As a member of the team, I’m looking forward to being able to take the Gamevice hardware even further. Gamevice has an opportunity, with their website and their app, to create an incredible resource for Gamevice owners, as well as MFi and iOS gamers in general. Something with a reach, budget, and team far beyond what I was capable of at AfterPad, as a single person. I’m looking forward to bringing my expertise with AfterPad towards helping make this happen. The downside, of course: joining Gamevice means saying goodbye to AfterPad. As a part of Gamevice, I can make the mobile game controller ecosystem into a much stronger place than I can as an independent. I’ve seen what I can do as a single writer and designer – it wasn’t bad! I’m proud of what I’ve done; now I want to see what I can do working with the best mobile controller maker in the world. The AfterPad MFi game lists and controller catalog will close, effective immediately. I’ll be directing future improvements and cataloging new games at Gamevice Live. We have ambitious things planned over at Gamevice – you won’t miss the AfterPad lists for long! New editorial content on AfterPad will cease. Obviously, there’s a potential conflict-of-interest in running my own MFi gaming site while working for Gamevice. I’ve never compromised my values by doing anything other than speaking my mind here, and I certainly don’t intend to start now. I’m going to miss writing those controller reviews! The AfterPad forums will remain open for the immediate future. I don’t believe in deleting helpful content from other people without warning. Eventually, however, the forums might close. My writings on AfterPad will remain online. With a big banner directing people to this post. The AfterPad API will be closed. Sites and apps that use the AfterPad database will cease to work, unless they are updated. I’ve given advance warning to the sites that used the AfterPad database, and I have no doubt they’ll be fine. The @AfterPad Twitter account will continue to exist, but as my personal account. Don’t visit for MFi gaming news anymore, but if you want my random thoughts on other things, I’ll try not to disappoint. My personal writing and projects will continue at Unranged.com. I also post photos and artwork over there – I’m a pretty good artist! And to clarify something important, AfterPad remains entirely my own. I have never shared any of my readers’ personal information, email accounts, or private communications with anyone. I never will. As bittersweet as it is for me to be writing this message, this is not exactly goodbye. Quite the opposite, I hope. I expect you’ll be hearing from me very soon, in one form or another, from my new home at Gamevice. And I hope you’ll experience my impact in the products and services Gamevice has planned for the future. This is the end of an important chapter of my life, and I thank you, from the bottom of my heart, for supporting me. I’m incredibly excited about what I’ll be working on now, and I hope you’ll join me in where I go from here. I hope to talk to you again very soon. Federico Viticci and John Voorhees invited me to participate in the latest episode of the AppStories.net Podcast for an interview / discussion. We talk about the history of AfterPad, about the state of Apple gaming, and a about how sites like AfterPad can exist thanks to affiliate programs. This was my first-ever podcast appearance, and I think it turned out pretty well. One important detail: at the time this episode was recorded, Apple was planning to cut affiliate commissions from 7% to 2.5%. This would have a significant impact on my site, and many others. Apple seems to have changed their minds on this point, instead only cutting commissions on in-app purchases. You can give the episode a listen below, or subscribe to the podcast in Apple Podcasts, Overcast, or the player of your choice via RSS. This is a fascinating YouTube video from Gaming Historian about the history of the d-pad. Considering how long the d-pad has existed, you’d think most MFi controller makers would do a better job of it. Over the past year, Gamevice has been quietly working on revising their line of iPhone and iPad controllers. Today, they announced the fruits of their labor: the Gamevice line has been replaced with new, second-generation products. The sharp, plastic, convex analog sticks have been replaced with textured, rubberized, concave sticks. 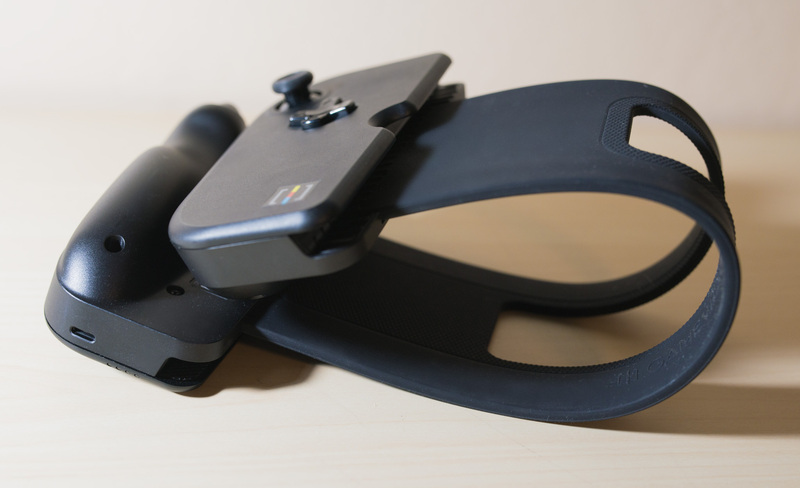 This makes them feel much closer to those of an Xbox One controller or full-sized iPad Gamevice. The Micro USB charging port has been replaced with a female Lightning port. No more carrying around a second cable! The terrible-sounding headphone jack has been replaced with a somewhat-better-sounding part. The Gamevice no longer has a separately-charged internal battery, and now draws power directly from the iPhone. The power draw is minor, and roughly equivalent to plugging in headphones. Analog stick sensitivity and dead-zones have been dramatically improved. This has been an area of focus since the debacle with some of the early iPad Air Gamevice products, and the result is some of the smallest dead zones I’ve ever seen on any controller – bravo! Lastly, this new model supports the iPhone 7 Plus. The previous model was too tight to fit the larger camera bump on the newer phones. In the case of the iPad Gamevice products, the improvements seem to be limited to removing the internal battery, replacing Micro USB charging with a female Lightning port, and possibly improving the headphone jack and analog stick sensitivity – I’ll have to wait until I get my hands on one before I can say one way or another about those. The iPad Gamevice line was already quite good, and didn’t need the level of work that went into revising the iPhone product. Also, as far as I can tell, the current 12.9-inch iPad Gamevice already counts as a Version 2 product. Many of the things I mentioned in my review – that it charges via Lightning, lacks an internal battery, and has the revised box art of the new product line – seem to be rolling out to the rest of the product line with this new update. I’m not sure what they’d change with this model. And since it’s only been on the market for a few months, it would be odd to see it replaced already. If it turns out that it has been replaced by a new model, I’ll update this article with specifics about how the new model is different. If you are looking for one of the new Gamevice models, you can tell the difference by checking the box art. The Version 2 products have a revised box design featuring an angled picture of the product, whereas the older version shows the product directly from the front, without an angle. 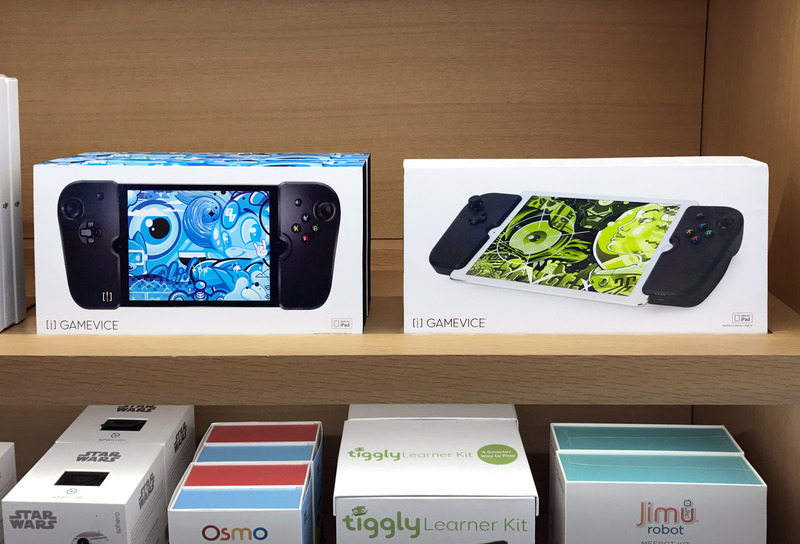 The new Gamevice products are rolling out to Apple Stores now. The people behind the Gamevice say that the 9.7-inch iPad and 12.9-inch iPad models are available in-store now, and the iPhone 7 and iPad Mini models are scheduled to be released on the 31st. However, in my experience, the new iPhone model seems to already be available in the Apple Store. My advice: head to your local store to check for yourself. 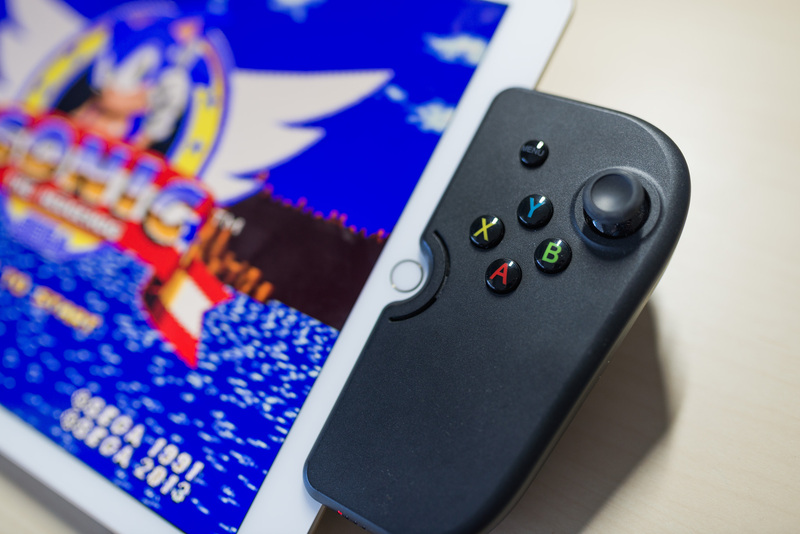 The iPad Gamevice has long been my favorite MFi controller. Ever since I used an early prototype of the iPad Mini model, I’ve been convinced that the Gamevice is the best way to play iOS games. If you’ve seen my review of the smaller Gamevice, you know the general gist of what I’m going to say here. I love the form-factor, the build quality is excellent, and the price – while high – is reasonable for the quality of the product. The question with this larger device is simple: does the Gamevice form-factor still work on a big-screen iPad? Unlike its predecessors, the 12.9-inch iPad is large enough to be comfortably used on a table, like a small TV, and controlled with a wireless Bluetooth controller. Some gamers might prefer this, but I’m not one of them. To me, this play style fails to take advantage of what the iPad has to offer as a gaming device – it turns the iPad into a (rather tiny) Apple TV. The beauty of the iPad has always been in the way you can hold it in your hands and directly control what is happening. There’s an intimacy to iPad gaming – it is fundamentally different than console and PC gaming, and you lose this intimacy when you use a traditional Bluetooth controller with your iPad. 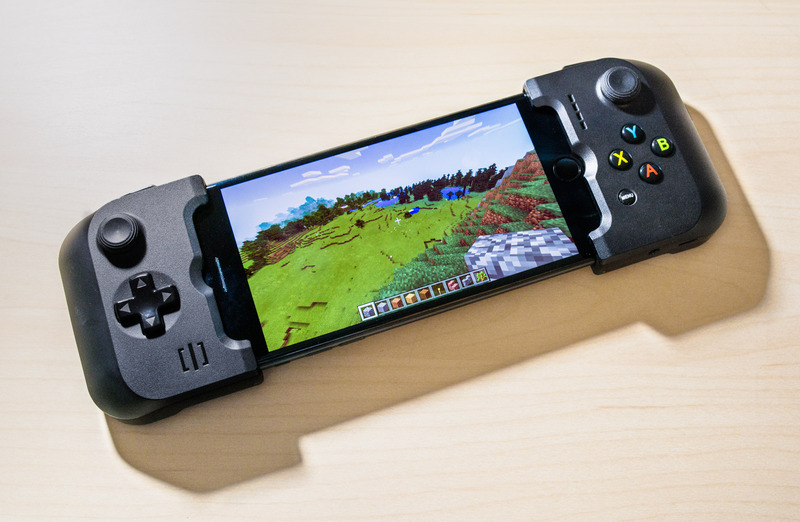 The Gamevice is different from other iOS controllers. It embraces everything great about the iPad, rather than trying to turn the iPad into something it was never meant to be. And unlike with the iPhone Gamevice, the design and build quality of this iPad Gamevice model is excellent. When the iPad Mini Gamevice launched two years ago, it had a better d-pad than every other MFi controller – by leaps and bounds. Amongst a sea of mushy circular d-pads, the Gamevice launched with a responsive, plus-shaped design. The competition has improved since then. The PXN Speedy, Horipad (regular and Ultimate), and SteelSeries Nimbus all have better d-pads than any of the Gamevice’s old competitors. Many of them even feature plus-shaped d-pads. Because the original Gamevice was so far ahead in its original design, it still holds up against its new competitors. It isn’t quite as nice as the d-pad on the new Horipad Ultimate, but it’s a close second. The size is perfect, the texture is pleasantly grippy, and it is calibrated well enough to prevent accidental diagonal movements, without making these movements too difficult. If I’m nitpicking, it is a bit stiffer than I’d like – you have to press a bit harder than you should to activate it, which is why I’d rank the Horipad Ultimate’s d-pad a little higher. But overall, this is a great d-pad, and fans of retro games should be happy with the Gamevice. The shape and feel of the Gamevice’s analog sticks feel like they’ve been lifted straight from an Xbox One controller; that’s a good thing, because the Xbox One controller has great analog sticks. 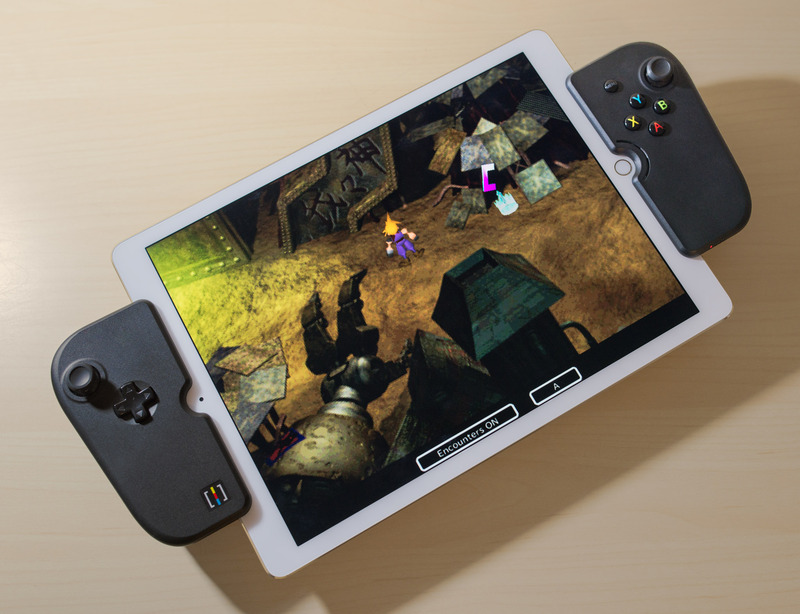 And because the Gamevice is a Lightning-connected controller, its analog sticks communicate with the iPad at a much faster rate than older Bluetooth controllers, meaning they are potentially more responsive to quick motions. Some early-production-run 9.7-inch iPad Gamevices suffered from major calibration issues, leading to significant analog stick dead zones. In short, you had to push the analog sticks noticeably far before they start registering movement, and the analog sticks think they’ve reached the end of their range well before they’ve actually been pushed all the way to the edge. Deadzones can cause issues in any game that requires responsive, precise motion. Because there’s a buffer between when your thumbs start moving and when the controller starts reacting to your thumbs’ movement, it can often feel like what’s happening on screen isn’t corresponding to what you’re doing on the controller. Camera movement that is supposed to be gradual instead feels sudden. Characters move in octagonal patterns instead of fluid, 360-degree motions. This 12.9-inch Gamevice model is significantly improved from its predecessor, but not as much as I was hoping. Things have gone from terrible to adequate. It has the worst deadzones of the three modern MFi controllers, by far. The people at Gamevice have known about this problem for over half a year, and have been in direct contact with me throughout the prototype phase. I was hoping that this problem would be resolved. As it stands, the deadzones on this Gamevice don’t ruin the controller, but they are well behind those of the SteelSeries Nimbus and the Horipad Ultimate. The Gamevice’s ABXY buttons have the exact same same size, shape, texture, and layout as an Xbox controller – medium-sized buttons, generously spaced away from each other, with a convex outer surface. These buttons are unchanged from the previous iPad Gamevice models, and thats a good thing, because they’re pretty much perfect. The three-dimensional ABXY buttons on the SteelSeries Nimbus look a bit cooler, and are a bit larger, but the more generous spacing between the Gamevice’s buttons make for a better playing experience. In my experience, the games that make the most demanding use of the ABXY buttons are button-combo-based games like Tekken and Tony Hawk’s Pro Skater. I spent time playing both of those via emulation, and no matter how intricate the button presses, the Gamevice never missed a beat. These buttons are first-rate. Poor-quality triggers have ruined multiple MFi controllers. Thankfully, the triggers on the iPad Gamevice are excellent. They’ve been excellent ever since the very first iPad Mini model, and they’re still top-quality. The texture is grippy, the sensitivity is perfect – nothing to complain about here! The shoulder buttons are similarly solid. They’re a bit more recessed than I’d like, requiring you to strain your fingers just a little bit more than would be ideal. But this is just nitpicking – considering how badly some of the other controllers dropped the ball with their shoulder buttons and triggers, the Gamevice deserves credit for getting this right. The biggest upgrade to this 12.9-inch iPad Gamevice is something you can’t see – way it manages power has been completely redesigned. Previous Gamevice hardware included dedicated batteries. These batteries didn’t supply power to the iPad, nor could the Gamevice draw power from the iPad once its integrated battery died. This never made sense to me, and I couldn’t get a straight answer from anyone about what the logic behind this was. Anyways, it’s gone now – the 12.9-inch Gamevice draws power directly from the iPad. That means no more keeping track of its battery life – when your iPad dies, your Gamevice dies; until then, game on. In addition to removing the superfluous battery, this Gamevice finally ditches the Micro USB input, in favor of a female Lightning port. This is an extremely welcome addition – no more extra cable required to charge the controller! When you’re running low on power, you don’t have to remove your iPad from the Gamevice – just plug it in to your standard Lightning cable, and keep playing as long as you want. One caveat: the Gamevice is only capable of passing through 12W of power to the iPad Pro from its Lightning connection. This is not enough to actually charge the 12.9-inch iPad Pro while playing performance-intensive games – merely enough to tread water. Apple solved this problem by releasing a 29W USB-C power charger and cable. Unfortunately, the Gamevice doesn’t take advantage of this high power charger, and instead caps the input to a maximum o 12W. I can’t think of any non-Apple devices capable of charging the 12.9-inch iPad Pro at full speed, so I think this is probably a restriction of the MFi program, rather than something to blame Gamevice for. Lastly, the Gamevice’s dedicated headphone jack is gone. It wouldn’t have made sense on this model, because the Gamevice doesn’t block the 12.9-inch iPad Pro’s headphone port. But who knows what the future holds? If future iPad Pro devices ship without a headphone port, the makers of the Gamevice might regret omitting one. Apple’s new Lightning EarPods do not work with the Gamevice’s Lightning port, so if Apple decides to ditch the headphone jack on future iPads, Bluetooth headphones will be your only option. I rarely spend much time talking about controller software in my MFi controller reviews, because the software is rarely worth talking about. However, Gamevice Live is worth discussing in more detail, because it is more ambitious than software from other controller makers. The Gamevice Live app (much like this website) is designed to be an interface for finding controller-compatible iOS games. It acts like a mini-App-Store, complete with featured app banners at the top, and genre-sorted sections for browsing catalogued games. Select a game, and the app shows you its iTunes description, price, and (for popular games) a map of the game’s controls. Full disclosure: the Gamevice Live app is technically a competitor to my site. Although they paid me a lump sum over a year ago for one-time access to the AfterPad Game Database, I no longer have any ties to their app. Every game downloaded through the Gamevice Live app is a commission I don’t make on AfterPad. This is different than apps from other companies, where AfterPad supplies data directly to the apps, and I get a commission on app sales. I do, however, like the Gamevice, and I know and like the people behind the product. If you have any doubts about my ability to be objective, take the following with a grain of salt. In my objective-as-possible opinion, the Gamevice Live app is a mess. Right of the bat, it isn’t optimized for the 12.9-inch iPad’s screen, resulting in blurry text and oddly sized graphics. This makes no sense when you consider that it merely a web view containing the Gamevice Live website – a website that scales perfectly fine to the 12.9-inch iPad Pro’s screen. Even forgiving the blurry interface, the app doesn’t feel like it belongs on iOS. Scrolling is jerky and lacks rubber-banding, button presses are laggy and offer no visual feedback, there’s a hamburger menu at the top right that merely acts as a second way of loading the All Games screen, many of the graphics aren’t optimized for Retina, the list of genres includes a bunch of non-English entries… the list goes on and on. It gets worse: every time you connect your Gamevice, it displays a pop-up notification prompting you to install the Gamevice Live app. If you already do have the Gamevice Live app installed, it will prompt you to launch the app. Worst of all: if you leave your iPad connected to your Gamevice, you will receive a push notification every 5-10 minutes asking you to launch the Gamevice Live app. It is impossible to disable these notifications. The only way to make the notifications go away is to uninstall the Gamevice Live app. If you still want to use Gamevice Live after this, you should save the Gamevice Live website to your bookmarks or home screen, instead of using the app. The website is the exact same thing, but without the incessant pop-ups, and with support for the iPad Pro’s screen support. Personally, I’ll be sticking with my own site instead – although I probably should borrow their idea of listing detailed control layouts for popular games. 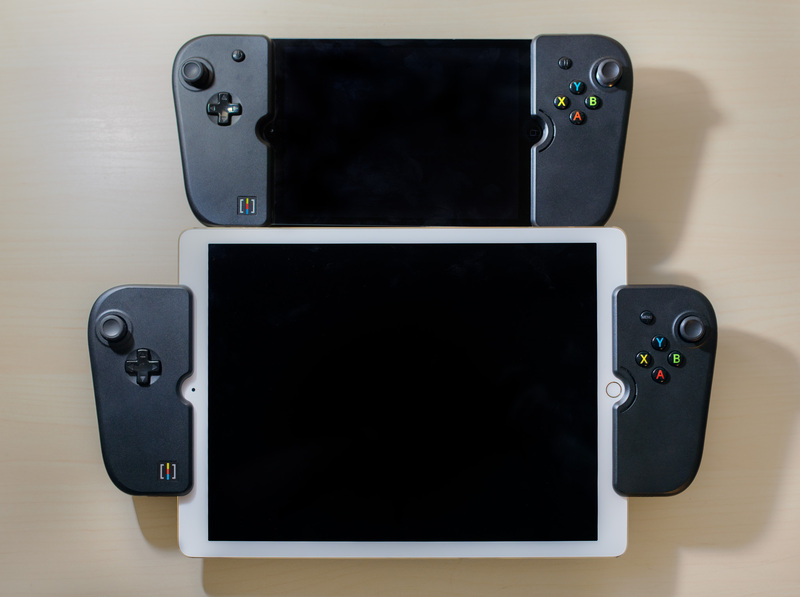 If holding your iPad and controller in your lap while you game appeals to you, the 12.9-inch iPad Gamevice is an excellent controller – one of the best on the market. 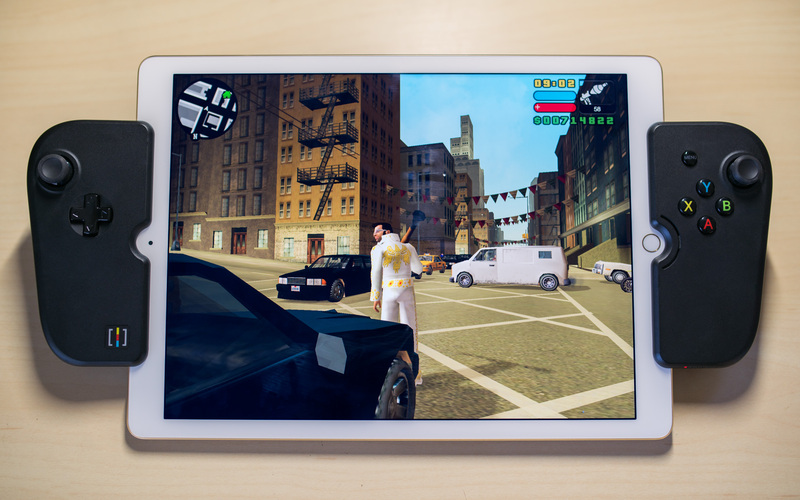 In every regard except the analog sticks and the app, the 12.9-inch iPad Gamevice is first rate. The analog sticks aren’t that bad, and nobody buys a controller for the companion app. If the form factor of the Gamevice appeals to you, buy it. The polish of the product and the quality of the gaming experience is well worth the price. Fresh off the back of a successful console port, the original iOS version of Oceanhorn was just updated to take full advantage of the latest iPhone 7 hardware. In addition to new graphic effects, this latest update adds a “Power Boost” toggle, which allows you potentially get enhanced performance at a cost of battery life. As someone who never runs into battery trouble, I wish all games had this – give me maximum performance any day! Oceanhorn has always been a top-tier iOS game, and the developers have consistently updated and improved it to take advantage of the latest iOS technologies. Except, oddly enough, for 12.9-inch iPad Pro resolution support. Maybe someday. If you’re an RPG fan who somehow failed to download Oceanhorn before now, well, there’s no time like the present to experience one of the best RPGs on the iOS platform. In what is quickly becoming a Thanksgiving tradition, a bunch of iOS games are currently on-sale at significant discounts. Even if you don’t celebrate Thanksgiving, everybody likes cheap games! I’ll be updating this list as more games are discounted. There are already some good choices – Geometry Wars 3 and Limbo are essential games – and there are likely many more to come. The Gamevice is finally available for the 12.9-inch iPad Pro – barely squeezing in under the wire for its promised October release date! I’ve actually been using a prototype of this product for the past several months, and I can say this: unless they dropped the ball in a critical way with the final product, this should easily be the best Gamevice yet. Two of the bigger issues with previous models have been solved: the Micro USB input has been replaced with a Lightning input jack, and the questionable-quality headphone jack has been removed entirely (it isn’t necessary since the iPad Pro’s headphone jack isn’t obscured by the Gamevice). For me, the only question mark is the analog sticks. I’ve had many conversation with people from Gamevice after the questionable analog sticks in the 9.7-inch iPad Model, and I know that significantly improving the analog sticks was an area of focus with this product. What I don’t know if if they were actually successful in improving the analog sticks. I’m hoping to find out as soon as I can get my hands on the final Gamevice hardware. Great review of a great game, from The MFi Guy. The MFi Guy is new on the scene, but definitely looks like someone who folks interested in MFi gaming should keep an eye on. This is the first in a series of articles I’ve been working on: reviews of iPad Pro keyboards! Those of you who’ve been reading me for a long time might know that I’m a full convert to the so-called “post-PC world”. I do the vast majority of my writing and coding for AfterPad on my 12.9-inch iPad Pro, only returning to the Mac for particularly tricky web layout problems or photo editing. Part of the reason the 12.9-inch iPad Pro is such a great computer is that unlike most laptops, it doesn’t come bolted to a terrible keyboard. The iPad can work with any style of keyboard you want, in any form-factor you want. Much of the time I’m using my iPad Pro, it’s with a mechanical keyboard. But when I’m on the go, or working while sitting on a couch or lying in bed, a keyboard-case is necessary. I decided to put every available option I could find to the test, and try to narrow down a recommendation. This will be an ongoing series, with at least ten parts. For the first part, I wanted to start with the keyboard that was, perhaps, my most anticipated – the Brydge. At $189, the Brydge is the most expensive keyboard I’ll be reviewing. 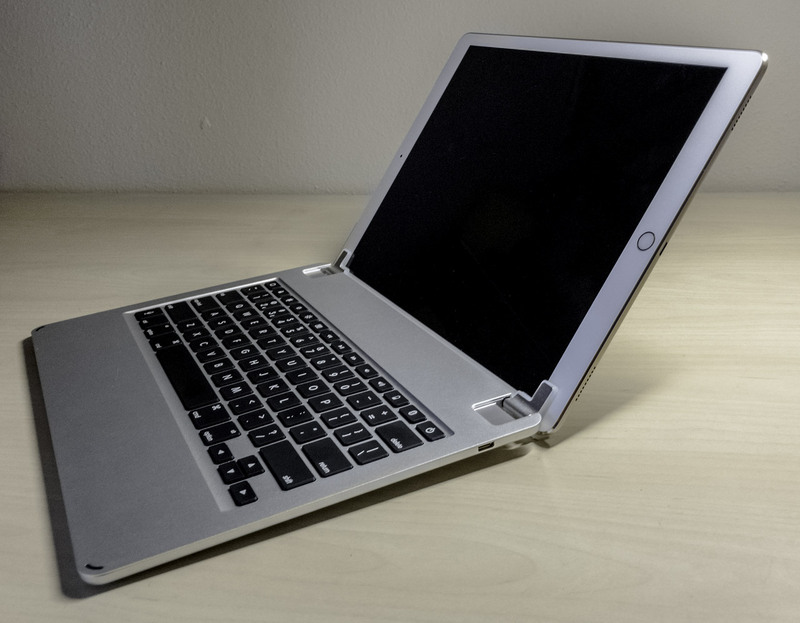 On paper, it seems to justify the price: backlit keys, full anodized aluminum construction, a clean and minimalist appearance, cutting-edge Bluetooth – everything you’d expect in a premium product. The Bridge Pro has my favorite design by far of every iPad Pro keyboard I’ve used. It is the only functional keyboard that can be used equally well sitting at a desk, sitting on a couch, and lying in bed, and at the same time is easy to detach from the iPad. Unfortunately, there are two major problems with the Brydge that make it impossible for me to recommend. First, the hinges aren’t sturdy enough. You can push the iPad Pro to approximately a 40Â° angle away from you; any further, and it falls back under its own weight. 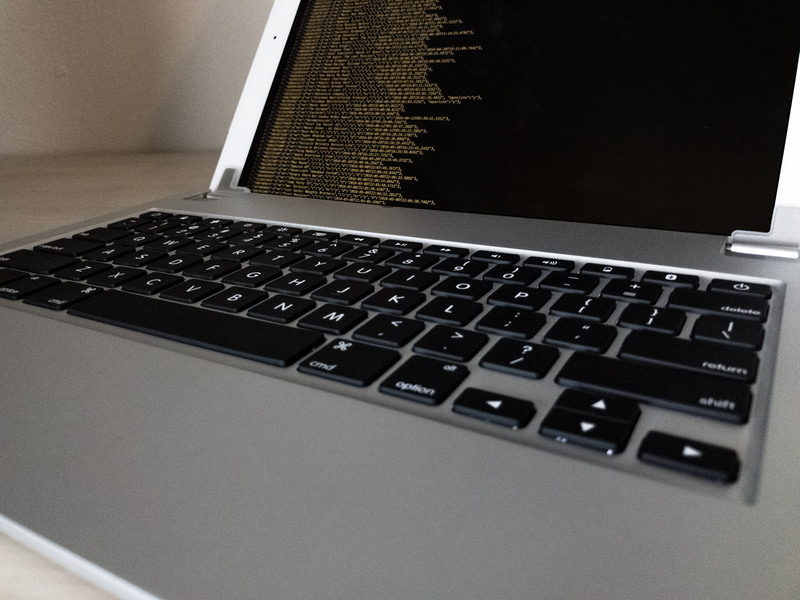 40Â° is a decent amount for use on a desk or use lying down in bed, but it’s simply not enough to use while sitting with the keyboard in your lap. The biggest issue with the Brydge: the keys are unpleasant to touch. They have a dry, scratchy texture to them – my fingers bristled every time I rested them on the keys. The keys appear to be constructed out of a piece of transparent plastic, with everything but the symbols painted over with a thin coat of black paint – your fingers end up rubbing against the paint layer, which doesn’t have the pleasant texture of a good piece of plastic. You see this a lot in the cheap backlit keyboards you can grab from Chinese sellers on Amazon, but it’s inexcusable in a keyboard that is positioned (and priced) as a premium product. As much as I like the idea of the Brydge, and the overall design of the Brydge, it simply isn’t good enough. 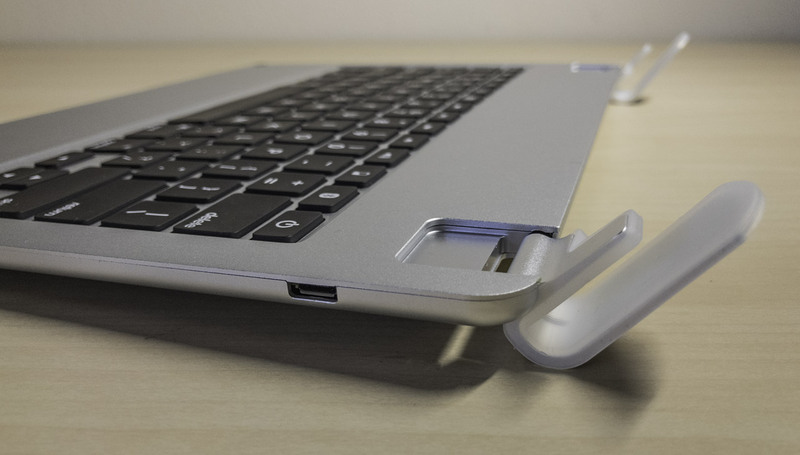 Premium construction and clever design don’t matter if the keyboard is unpleasant to use. None of the other keyboards I’ve reviewed feel as “premium” as the Brydge, but many of them are a lot more pleasant to type on, at much smaller price tags.